This is a good video that explains why the Yilu is practiced the way it is, rather than a continuous flowing motion. Each structure must be fully expressed before moving on to the next action and structure. Since the power comes from the structure itself, if we don’t adhere to this principle we will not be able to develop any gongfu. Wow…..just watched a yilu the other day by one of the students. I observed that he was moving in a way that I seemed to be lacking. There was a strong sense of structure in his set. So I decided to wake up this morning and work on the concept. Synchronicity then reared up…..Wilkin suggested we watch this vid to promote a discussion…..I am blown away….this video directly addresses some of the issues I noticed about my yilu….it is perfect timing for me. I strongly recommend this video for everyone.. it’s funny, when I’ve taught Yang style Taijiquan in the past, I’ve encouraged students to pause and check structure after every change, but somehow when I was practicing the yilu, I was not following my own advice. 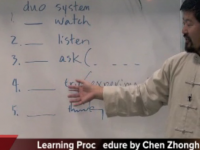 Thanks Master Chen for another excellent learning video. This is another out take of four Yilu corrections of students attending the Week long Edmonton Seminar June/July 2013. Each person corrected gave a particular element that needs to be included for correct practice. Structure as shown here is so completely needed and is so appropriately demonstrated in this video, that this is a must have video. Highly recommended with the video of Carlos. Thank you very much so another lesson. I miss this very much. This will focus my practice for months! Great lesson on how to keep/not lose power. Also great lesson on how to be a good humble student . Otherwise we cannot learn anything. Pummeled with correction. Hard, but good for the spirit ! No better way to learn, and understand. And the care given from the teacher is second to none. Something to appreciate !